Searching For Scholarships - ScholarshipsCanada.com! Using the search tools on Scholarships Canada can really help you and your students find scholarships! 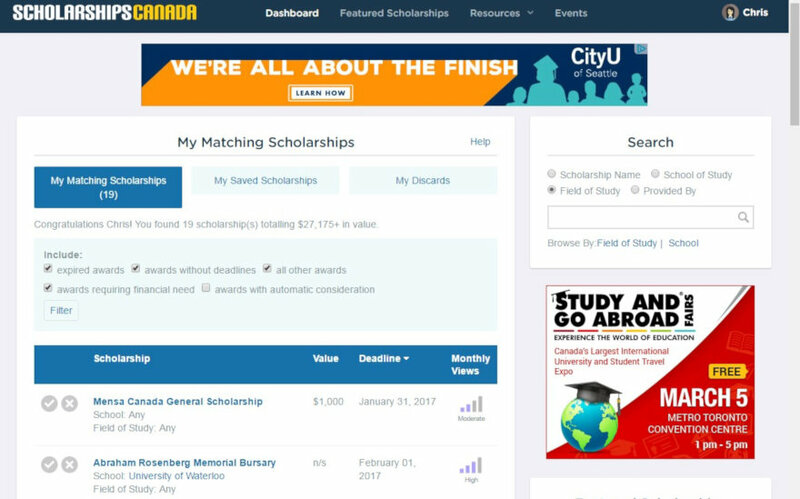 With over 85,000 scholarships and bursaries in the ScholarshipsCanada.com database finding the right one can be overwhelming. Using some of the search tools on the site can really help with this task. The easiest way to find scholarships is to create a profile on ScholarshipsCanada.com. Be sure to fill out as much information as you can - this will optimize your match. Once you have completed your profile, you will land on YOUR dashboard where you will find your matching scholarships listed. You can use the filter options at the top of the list and the column headings to help sort your scholarships. Remember you can change your profile at any time. When you find a scholarship that you want to apply to or get more information on, you can save it by clicking the check mark beside the scholarship name. If you are not interested, you can check the x-mark to discard the scholarship. These saved and discarded scholarships will go into the appropriately marked lists. Each scholarship profile has details on deadline, requirements and further contact information. TIP 1 - Monthly Views is an indication of how many people have viewed the scholarship. The scholarships with very high views will be more competitive. The ones with low monthly views will be less competitive - and may be the hidden gems! TIP 2 - Sign up for scholarship deadline alerts to ensure that you are notified of scholarship deadlines! Every month the site will list featured scholarships. It is always worth checking those out at http://www.scholarshipscanada.com/Scholarships/FeaturedScholarships.aspx. You find can more tips at http://www.scholarshipscanada.com/Section/9/Tips.